The action-packed semi-finals of SEA Games 2015 concluded with Malaysian shuttlers dominating the scene. Men’s singles and women’s doubles will showcase all-Malaysian finals, while Chan Peng Soon / Goh Liu Ying will represent the country in mixed doubles. Chong Wei Feng (pictured) reigned over defending champion Tanongsak Saensomboonsuk, 13-21, 21-18, 21-15. While Tanongsak seemed to have the upper hand in his attacks in the first game, Wei Feng’s change in tactic in the second and third games proved deadly. The two left-handed rivals tried to outwit each other on court, but Wei Feng’s attacks were much more accurate and towards the end, Tanongsak committed more unforced errors. In the end, the Thai shuttler had to be satisfied with a bronze medal in this year’s SEA Games and let a new champion to emerge. Wei Feng will fight for his title against compatriot Mohamad Arif Abdul Latif. Abdul Latif denied 18-year-old Singaporean Loh Kean Yew a spot in the finals and defeated him in straight games, 22-20, 21-15. In battled between Malaysia and Indonesia in the women’s doubles event, both Malaysian pairs came out victorious. Vivian Hoo / Woon Ke Wei beat Anggia Shitta Awanda / Ni Ketut Mahadewi, 21-12, 21-11. Amelia Alicia Anscelly / Soong Fie Cho marched into the finals by defeating Maretha Dea Giovani / Suci Rizki Andini. 21-16, 23-21. Indonesia is assured of gold and silver medals in men’s doubles. Marcus Fernaldi Gideon / Kevin Sanjaya Sukamuljo (pictured) won convincingly against Filipino pair Ronel Estanislao / Philip Joper Escueta, 21-14, 21-12. 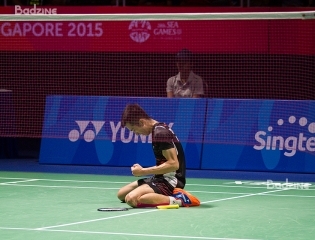 Meanwhile, rising stars Ricky Karanda Suwardi / Angga Pratama dashed Singapore’s last hope for a final spot. They reigned over Danny Bawa Chrisnanta / Chayut Triyachart, 21-12, 21-18. Mixed doubles, on the other hand, will see Indonesia fighting against Malaysia for the title. Indonesian duo Praveen Jordan / Debby Susanto survived their semi-final match against Sudket Prapakamol / Sapsiree Taerattanachai, 21-13, 8-21, 21-14. Waiting on the other side of the court are Chan Peng Soon and Goh Liu Ying (pictured). Chan / Goh successfully overcame the Indonesian pair Riky Widianto / Puspita Richi Dili, whom they recognised as one of their toughest opponents in the tournament. Chan / Goh won in three close games, 21-18, 18-21, 22-20. Thailand managed to squeeze in one representative in the final. Women’s singles defending champion Busanan Ongbumrungpan booked her finals appearance in Singapore after winning her match against Vu Thi Trang, 21-11, 21-17. Busanan will face Hanna Ramadini who had a tough battle against Goh Jin Wei. Hanna eventually thwarted her Malaysian opponent in three games, 16-21, 21-12, 21-18.